EuroMillions, a transnational lottery, is one of the most popular games in the industry. It offers mega-sized jackpots that grows when a rollover occurs. In other words, you can win hundreds of millions here – and in Euros, too. I know you’re probably itching to head on over to your favorite lottery site to play, but, before you do, read on and arm yourself with some EuroMillions knowledge! EuroMillions was launched on February 7, 2004 by France’s, Spain’s and United Kingdom’s respective lottery operators. Initially, the aforementioned countries were the only ones that participated in the EuroMillions draws, but Austria, Belgium, Ireland, Luxembourgh, Portugal and Sweden later joined in on the October 8, 2004 drawing. Residents of legal gambling age from these 9 countries can participate in EuroMillions – though online players from other countries are welcome as well. Mega Prizes: True to its name, EuroMillions can offer jackpots well into the hundreds of millions in Euros. Bi-Weekly Draws: Draws are held bi-weekly, on Tuesdays and Fridays, at Paris. This means that, yes, you can have twice the chances of winning each week. Tax-Free: Except for residents of Switzerland, Spain and Portugal, all prizes (including the jackpot) are 100% tax-free. Lump Sum: Prizes are paid in lump sum, and there is no annuity adjustment. EuroMillions is slightly similar to how other lottery games function – but they put their own spin on the formula. The gist is this: You select five numbers from 1 to 50, plus two additional numbers – also known as Lucky Stars – from 1 to 12. For players to win the jackpot, all five main numbers and both Lucky Stars have to match the combination drawn. The standard pricing for one EuroMillions ticket costs €2.50, but it may be a bit higher in some online outlets due to additional fees imposed by some lottery sites. 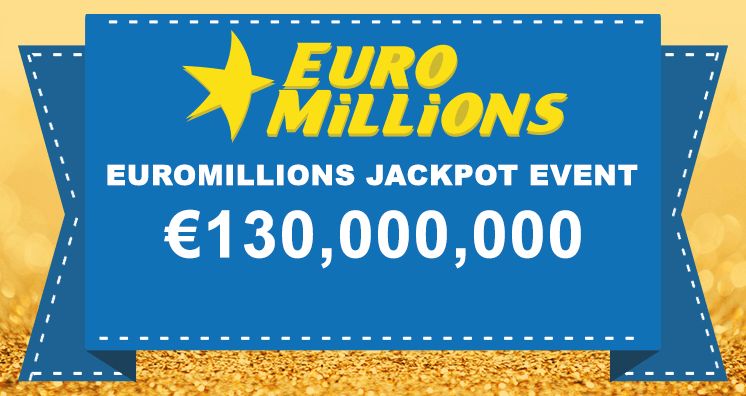 The EuroMillions Super Draw offers a guaranteed minimum prize of €130 million! The EuroMillions Super Draws are special events held every now and then that ensures a big payout to winners. These draws function pretty much the same as any regular EuroMillions draw, with one difference: jackpots are set to a guaranteed amount of at least €130 million. Should no one win the jackpot, it will simply roll over to the succeeding draw, and the next, and so on until it reaches the €190 million jackpot cap. The jackpot can remain at the aforementioned cap for a total of four drawings. If no one still wins the jackpot, then the prize money will be distributed among winners of the 2nd prize tier. This is what is called an Event Draw. So far, however, there has never been a EuroMillions Event Draw. Unlike other lottery games, if you win the jackpot in EuroMillions, you don’t have the option to be paid in annuity. Instead, jackpots are paid as a lump sum – which means that you get to take home more than if annuity adjustments were involved. As for taxes, you will be glad to know that EuroMillions games are tax-free – except for three European countries, that is. Portugal, for starters, takes 20% taxes from prizes exceeding €5,000. Spain, on the other hand, takes 20% off from prizes that exceed €2,500. Switzerland players have it worst though. The taxes collected from their winnings are approximately 35%. Because EuroMillions is a transnational lottery, there will be differences with how countries handle certain aspects of the game (as shown above regarding taxes). The time period you are allowed to claim your prize is no different. Austria, for example, gives winners a total of 28 days from the date of the draw to collect their winnings. Countries like France and Monaco, meanwhile, gives you 60 days. Luxembourg does the same. The biggest EuroMillions’ jackpot won was October 24, 2014, when an anonymous winner from Castelo Branco, Portugal nabbed the €190 million prize. The astronomical prize was the result of six roll overs. The second biggest win happened on August 12, 2012 when couple Adrian and Gillian Bayford won the £148,656,000 jackpot. Their story took a sad turn, however, as their new life – and the new problems that come with it – took a toll on their relationship. They have since divorced and are now living separate lives. Next up are Colin and Chris Weir who, in July 12, 2011, won the £161,653,000 jackpot. The couple went on to establish the Weir Charitable Trust, a charity organization that aims to support the Scottish community by way of funding worthwhile projects. The fourth biggest winner is a French citizen that chose to stay anonymous. He won the November 13, 2012 draw, which made him €169,837,010 richer. Winning instantly made him the largest winner from France at the time – not to mention the 221st richest man in his country. France is said to be the luckiest country that runs the EuroMillions. In fact, over 85 jackpot wins have been recorded to come from the country. The 3rd biggest EuroMillions winners, Colin and Chris Weir, became richer than Ringo Starr (whose worth was £150 million), Phil Collins (whose worth was £115 million), and even the late David Bowie (whose worth was £100 million), at the time. The odds of EuroMillions are so promising that, if you entered every draw for a year, there is a very high chance that you’d win 8 times, on average. The June 8, 2012 draw would have made the winner £63,837,543.60 richer – if he/she bothered to claim it! It’s easy to see why EuroMillions became one of the most popular lotteries around. Not only does it offer players the chance to win millions of Euros, the lottery is known to have pretty good odds compared to other lottery games. A 1 in13 odds of winning any prize is definitely impressive, after all. Beyond that, it’s also a largely tax-free lottery – with the exception of a few countries – and jackpots are paid out in lump sums. In short, there’s a good chance that you’re going to take home more of your winnings. Joining a EuroMillions drawing is a no-brainer, really.